Lip dryness may sound familiar for most people, especially in the winter. For me, my lips are dry all season. I often like to apply lipstick underneath lip gloss, as lipstick is more pigmented and matte to last the wear of color. However, most lipsticks dry out my lips within hours if I don't give my lips enough "mask" time (i.e: priming the lips with coats of lip balm to keep them moisturized and supple, then the lip makeup would go on evenly and smoothly). Guerlain Kiss Kiss Lipstick has been available since 2005. This product quickly grabbed my attention for its lasting color effect and moisture. There are two lines of lipstick under KissKiss Lipstick. KissKiss is more pigmented for a velvety finish. The other one, KissKiss Maxi Shine, provides a sheer and volume effect. I tested both of them at a local department store and was so happy with the experience and result. I came home with #563 Pretty in Pink, and #663 Strawberry Shine. The former is from KissKiss line and the latter from KissKiss Maxi Shine line. KissKiss Lipstick is the perfect choice for me to fight the condition of dry lips and stay pretty. 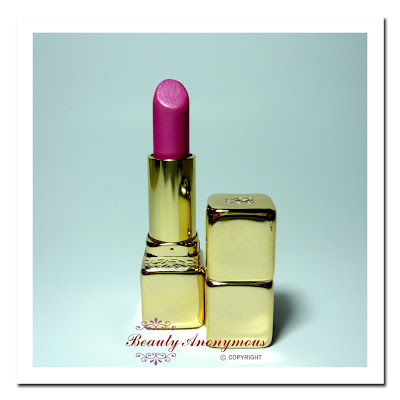 I am featuring Guerlain KissKiss Lipstick Pretty In Pink #563 on today's post. I'll share my experience with KissKiss Maxi Shine #667 Strawberry Shine on a separate post. #563 Pretty in Pink is a fuchsia pink. It has fine shimmer to deliver a pearly sheen. The fuchsia pink has a lilac undertone. I like to wear it alone especially on night occasions because #563 Pretty in Pink has the soft feeling of pearly fuchsia pink, and the lilac undertone gives the finish a feminine sophistication. It is medium-pigmented, so it provides depth and definition subtly without looking chalky or dull. KissKiss lipstick contains innovative Precious Reflect interferential pigments to create luminous effect. The reflection boosters reflect with light subtly. I am very surprised to find KissKiss lipstick has such an extraordinary silky texture. It feels so silky smooth on the lips. There were times when I was on a rush, I had only little time for a quick fix of lipstick. I didn't have time to apply layers of lip balm to condition my lips before wearing lipstick. I noticed KissKiss lipstick did an amazing job offering lasting moisture without drying or flaking the lips. According to the product information, it has CreamSoft Complex (Vitamin A palmitate, alpha-bisabolol and waxes), combined with oils for softness and moisture. Vitamin E soothes and protects the lips. KissKiss lipstick has a fruity flavor like rasberry, which is very appealing to me. The line is packaged in multi-faceted gold metal case. Each facet looks like a precious polished gold stone. The packaging has a minimal style with a sensual and exquisite feeling in modern luxury. Wonderful review! I've never tried Guerlain lipstick before and the Pretty in Pink shade reminds me of the new Lancome lippie in Desert Pink - so playful and fun for spring! I shall check out Lancome lippie in Desert Pink! Thanks a lot for the recommendation! I hope you will like Guerlain Lipstick too. Both lines from KissKiss and KissKiss Maxi Shine have a range of pretty shades. They are all really moisturizing lipsticks. This is such a beautiful shade. I am glad you also like the shade! 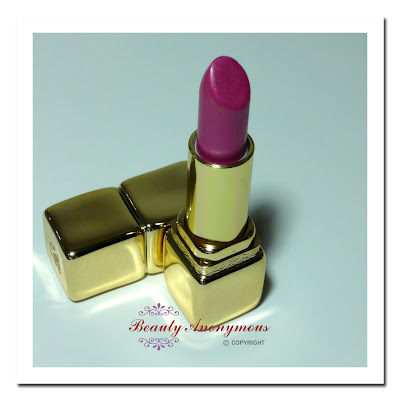 Please check back here as I will feature another lipstick of mine from KissKiss Maxi Shine. This is one of the best blue-based pink lipsticks I've seen, and the texture is lovely-very smooth and surprisingly long-lasting. When I remove my make-up it comes off easily but it lasts all day and does not deteriorate. I am writing from Australia and have been informed by Guerlain consultants at our departments stores that it has been discontinued, so I purchased two more! Thank you very much for your comment! And thanks a lot for sharing the information that Pretty in Pink has been discontinued. I agree with you. Pretty in Pink is one of my favorite blue-based pink lipsticks. I really love its moisturizing and smooth texture. I am glad you managed to purchase two more for yourself! Is there any other shade you also like from the line? Do you know if I can still get Pretty in Pink any where?